I have not yet been brave enough to write any posts about my kitchen. The main reason being that there are so many things I don't like about it that I'm a little afraid I will sound like a whiiiiinnneeeyyyy you-know-what. I have running water, all the food I need, appliances that work, enough spices to launch a restaurant, and I could go on and on. So I have made a little rule for myself. I'll call this the "One whine per post" rule. If I was being really hard on myself I would call it the "be incredibly grateful for your abundant life" rule. Also I will only post about an area of discontent if I can post about what I did to fix it. How's that? Oh - and how I fixed it for as little money as possible. Today's solution will be about my process of changing the ghastly back splash. I wouldn't really call it a back splash because it is/was really just some of that yucky fake tile you buy in 4x8 sheets. 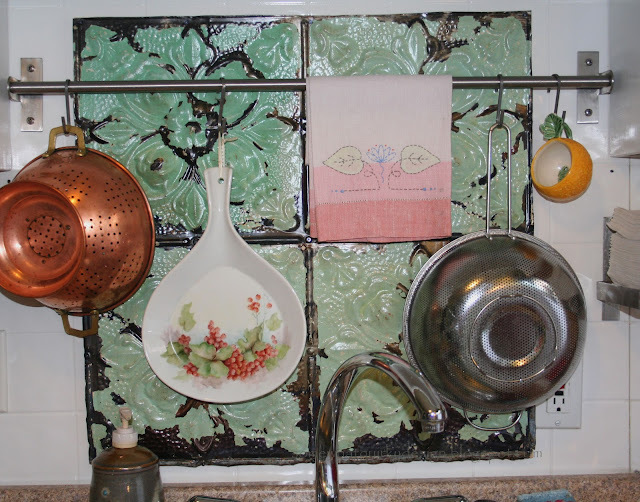 The area behind the sink side of my galley kitchen still has this lovely tile. Fortunately, I was able to change out the "tile" on the other side when we had to rebuild the stove side to add a new fridge last summer (a post for another day - when I find the pictures I lost yesterday), We replaced the fake tile with fake bead board - which is oh so much more attractive. I was a little worried about having a painted finish above the stove - because after all it is a back SPLASH - so I needed to come up with a solution that I found aesthetically pleasing. I love old tin ceiling tiles and have always wanted to use them in my decor so I headed out to a local architectural salvage place and found a huge panel - 2 squares by 4 squares, and bought it for $16.00. Cut tiles to predetermined size. Cut wood strips to fit to the longest edges of the tiles. Lay tiles face down and decide where you want your wood strips to be. Turn over and screw the tile to the wood - the tiles should have holes in them - where they were attached to the ceiling - if you need more holes just drill through the metal into the wood with a small drill bit. It is a good idea to pre-drill for each of the screws. Use a flat head screwdriver or needle nosed pliers to press down any edges that might not be curling under - this is for safety reasons. Cover with sealer of your choice. 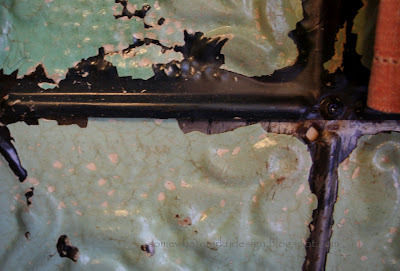 I used many coats because I didn't want the rust and paint chipping over my stove and sink. NOTE: I tried a spray water based acrylic first. It just did not seal like I wanted so I changed over to the lacquer. I did the exact same thing for my sink back splash except I had to use an additional board in the middle because I had two pieces that were 1 x 2 squares and I needed it to be 2 x 2. I LOVE. LOVE. LOVE. the way these look! Stay tuned - I remain optimistic that I will find the before pictures of the kitchen and that I will eventually get to change all of the other things I hate about it. If I follow my rules it could be a long time before I can post about them all! Beautiful vintage tin. I love the color especially. Thanks Liz. Glad you stopped by. Isn't it great? I'm glad you like it. Thanks for visiting! Did you make that vintage jewelry piece for your header? What a great idea! I have the same feeling towards my kitchen. Just doing one project at a time to make it better. I'm stopping over from the Coastal Charm link party and your newest follower! Would love it if you stopped over at my new blog. Thanks Kate - love to inspire any time I can! I visited your place - love the wine charms. I didn't know about that epoxy product. I'm going to have to make something with it now. This turned out great. I love it. Love them and the way this turned out beautiful color too. Thanks Cynthia. I just love the color too! Thanks for visiting. I just absolutely love the ceiling tiles and the patina finish on them is drop dead gorgeous!! Thanks Debbie! just to make clear - that the color is from the layers of paint paint left on the tiles - I just put a clear finish over it. Thanks for visiting! just beautiful!!! 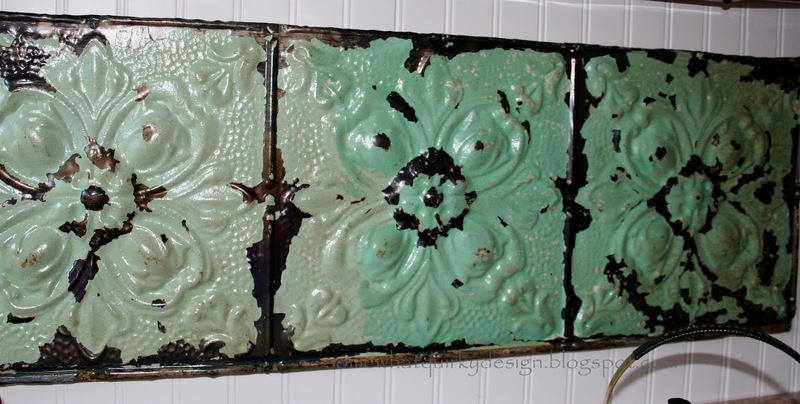 who doesn't love vintage tile? Love these vintage tiles, we just don't have tin tiles in the UK - although an online shop here is selling large antique tin tiles for £150 EACH - yeah, crazy right. That's about $225 !!! 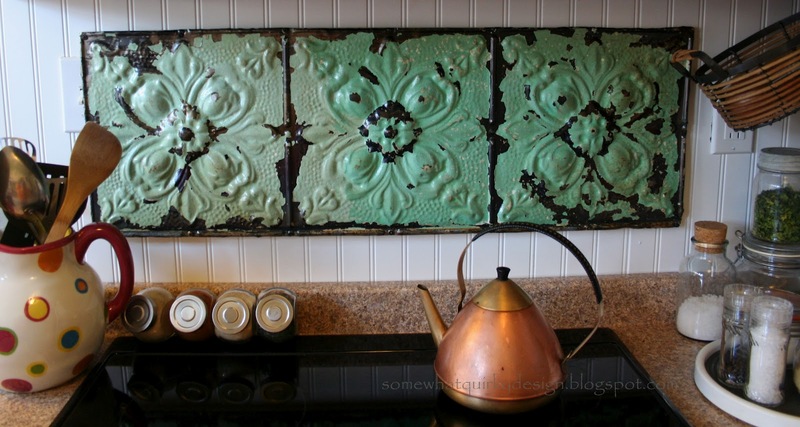 I LOVE the old tin tiles...creative way to use it! OM goodness, this has such great patina, I love it so much--Thanks for linking up! Your ceiling tins are beautiful, and I love how you used them in your kitchen. Great idea! That was a fabulous idea and it turned out beautiful! Thanks for sharing at Knick of Time Tuesday Vintage Style Party - you're being featured at the party today and there's an, "I Was Featured" button waiting there for you! 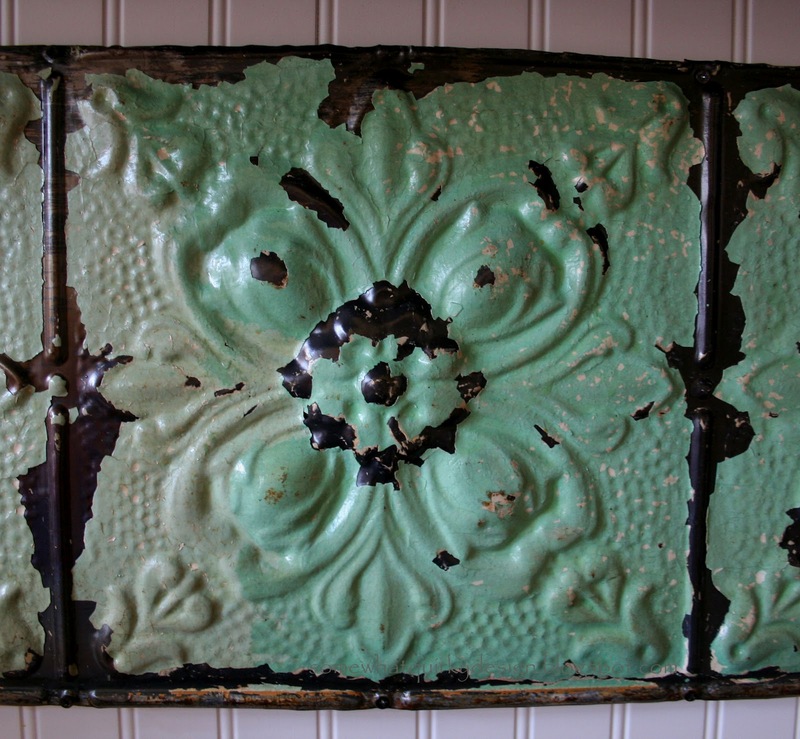 So you just showed up to the architectural salvage place and they happened to have this gorgeous colored tin? How do you do it?! I'm dying for some of this. I just love it in your kitchen. It's too perfectly imperfect. Sweet! How are the prices at the place you go? Just wondered if they sell things inexpensively or not. Two of the one's here that have anything cool are ridiculously expensive. Nice job. I have a thing for old ceiling tiles too! I love those tiles! 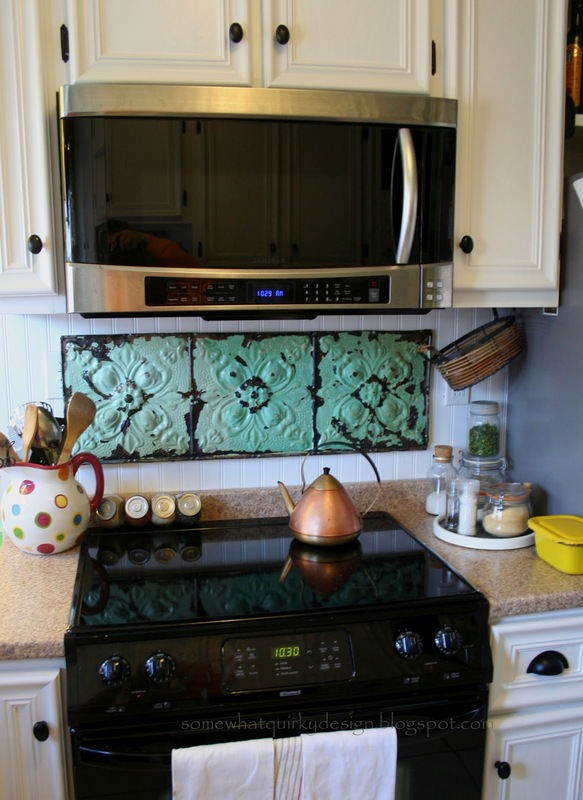 Great idea for a backsplash!